Lara is the pride of Trinidad. So it's no surprise that he would be part of the Americas Summit this past week in Trinidad. 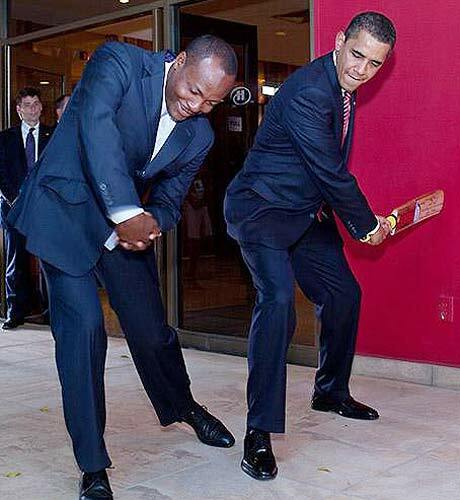 However, it's interesting that Obama personally asked to meet Lara, who he called the "Michael Jordan of Cricket". Seems like Mr. Prez knows a thing or two about that good ol' British colonial sport! And another interesting fact is that the Hilton hotel renamed its terrace to "Obama Terrace". Though I don't think Lara is too jealous about that, considering the main road in Port-of-Spain is called Brian Lara Promenade! And there's a cricket stadium in Trindad named after him too. Picture is below, and article is here. We are covering the Social Media Conversations of IPL 09 at http://iplt20.blogadda.com and your blog is featured there amongst the selected few. Keep posting such great stuff :). Will blogroll you in a bit. Seems, Obama really like humor.